Properly configured, these audio engineers in a box can simplify any multiple microphone audio system. Jim Zagryn, design engineer at VisionPoint configures the IP addresses for a corporate boardroom at Millennium Pharmaceuticals in Cambridge, MA. The Biamp Nexia units include a gated type automatic mic mixer for the table microphones only and are configured to allow three open microphones. In any AV application where there's more than one microphone in a conference room, auditorium, training center, classroom, or house of worship, chances are there's an automatic microphone mixer somewhere behind the scenes - or at least, there should be. Today's automatic microphone mixers have so many capabilities that most end users don't have any idea how to set them up or change them; in fact, many end users don't even know they have an automixer in their facility. "The ideal automixer is transparent to the end user," says Jim Zagryn, design engineer at VisionPoint LLC, an integration firm in Newington, CT. "If the designers and integrators have done their jobs correctly, all of the end user's needs are met during the system installation, and they never see the mixer." As the name implies, an automatic microphone mixer manages multiple microphones automatically, activating the microphones when someone speaks into them while keeping the other microphones at a reduced level (or off). This provides a consistent signal to the rest of the sound system and helps mitigate room noise and reverberation. Automixers are used in many different applications, and a number of manufacturers make them. They were first developed in the 1970s by Dan Dugan of Dan Dugan Sound Design in San Francisco. "I was designing sound for the regional companies of Hair in 1968. The shows had one person working rotary knobs for 16 area mics, 9 hand mics, and 10 mics in the band," says Dugan. "I got the idea that a microphone shouldn't be on unless it's getting something more than the room ambience." After several years of experimenting, Dugan came out with a patented system he called the "Dugan Music System" - which was demonstrated to the Audio Engineering Society in the early 1970s but didn't evolve into a product immediately. He later developed the "Dugan Speech System," which laid the groundwork for the "gain sharing" automixers used today. Dugan's method of mixing, which sets a maximum gain for the room and then smoothly mixes all microphones by splitting the overall room gain among all open microphones based on the signal levels at the microphone inputs, was patented by Dugan in 1975. Other manufacturers (such as Shure), recognizing the benefits of automatic mixing, soon developed an alternate mixing technique known as "adaptive threshold gating," where a microphone is activated based on the ratio of the audio level at the mic vs. ambient room level. "Each mixing method has its benefits," says Zagryn. "I personally prefer gated microphones to provide control over the number of people who are on at once, and gated systems keep room noise down, but there can be a bit of delay before someone's voice comes on so gated systems can be a bit choppy. Gain sharing mixers are much smoother but there's more noise floor - more ambient noise is picked up by microphones." Dugan's gain sharing patent expired several years ago, and now manufacturers such as Polycom and Lectrosonics incorporate their own techniques of gain sharing in their mixers. Some manufacturers provide both gating and gain sharing, giving integrators and users the option to set up the type of mixing that will work best for a particular application. Automatic microphone mixers are used in any "spoken word" application requiring several microphones, but the primary applications fall into two categories: collaboration (two or more sites doing audio or video conferencing) and "local" uses such as broadcast studios, auditoriums, conference/meeting rooms, legislative chambers, courtrooms, or houses of worship where the automatic mixer feeds the main audio system. All applications usually require some sort of sound reinforcement within the facility. Mixers specifically designed for conferencing incorporate functions that are required to improve audio clarity between sites - acoustic echo canceling, ambient noise reduction, etc. 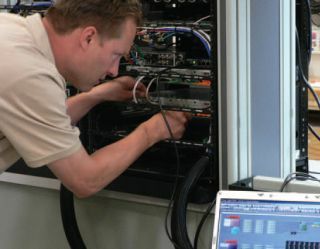 Manufacturers such as Biamp, ClearOne, and Polycom make mixers that include "distributed echo cancellation," or an acoustic echo canceler on every microphone input. Lectrosonics uses its own patented algorithm called "AutoSkewing," which uses the amplitude, frequency, and time domain information of a signal to establish a pattern for a microphone, and then prevents other inputs in the system from opening that same signal, preventing "false" channel activation. Other manufacturers use the output of a gated automixer fed to a single-channel acoustic echo canceler for conferencing applications. Automatic microphone mixers are available in analog format and in DSP-based configurations. Analog units offer smooth scalability for large applications - for example, Shure mixers can handle up to 400 microphones in a single linked system. DSP units, on the other hand, are packed with features that greatly enhance their ability to work in widely varied conditions. DSP units offer presets and macro functions that enable rapid changing of the system to meet varying requirements in the room (for example, a hotel ballroom that might need to be sub-divided and then re-combined later in the day). If you are using an automatic mixer for live sound applications, such as town hall meetings, make sure you know whether your mixer is a gating or gain sharing model before setting it up. "The biggest mistake people make with gain sharing is that they think they have a gate, and try to make it work like one," says Dugan. "They'll try to weight the mics so low that they turn off when there's no signal present. Some gain sharing mixers will let you do that, but it will result in mixing that is less than ideal -and if you're using one of my boxes this way, please cover up my name so no one will blame me for it!" Even something as fundamental as setting basic levels can confuse people who are inexperienced in installing an automatic mixer. Gordon Moore, VP of sales at Lectrosonics, says the most common error his staff sees in mixer installations is poor gain structure. "I'm speaking for all automatic mixer manufacturers, especially those who use a gain sharing technique: When you set up your mixing system, make sure you get the gain right on the input stage," Moore says. "All automixers work better when the gain has been properly set to give the system adequate signal to properly assign and effectively do the gain sharing the way it's designed. If a user inadequately amplifies the incoming signals into the system, the system will not perform the way it is supposed to." Most manufacturers also caution that automatic mixing systems are not designed for music and should not be used for that purpose. Because an automixer operates based on sound pressure levels at a particular microphone (this is especially the case with gated mic mixers), varying levels in music can result in a choppy mix that will not be pleasing to anyone. If you are setting up a mixing system in a house of worship, for example, manufacturers such as Lectrosonics and Shure recommend using an automatic mixer for speech microphones in the facility along with a standard "board" type mixer for the choir or praise band. Jim Smith, AV system engineer at Polycom, says manufacturer or integrator support for the more complex systems is essential. "It's extremely rare for an end user to have sufficient audio system knowledge to correctly manage an automixer configuration, especially with the newer DSP units," he says. "Most users know in advance what types of situations they will be dealing with - a noisy room, an open forum, a quiet meeting, etc. - but don't know the best settings for an automixer to accommodate those situations. The integrator and manufacturer can quickly set things up so that all of the pre-described situations are available to the end user as a simple preset available with a single button push." EVEN SOMETHING AS FUNDAMENTAL AS SETTING BASIC LEVELS CAN CONFUSE PEOPLE WHO ARE INEXPERIENCED IN INSTALLING AN AUTOMATIC MIXER. Zagryn concurs: "Setup of an automatic microphone mixer is usually done during the installation process and its configuration depends on the requirements the end user has described to the system designer. The main concern is tuning the automixer for the room and giving it the control functionality necessary through the AV control system. "You need to decide on things like volume control - do you have a single level control for everything or go with discrete controls for program, conference, and sound reinforcement? What about voice lift on or off, or room dividing or combining? All of these factors can lead to complexity in the control system, so we always try to ascertain the technical sophistication and needs of the end users before doing the installation and setting up the control system." Zagryn notes that the types of microphones used in a room also play an important role in how the system is set up. Table mics, ceiling mics, wireless mics, and lectern mics all play different roles in the system and should be assigned operational priority accordingly, he says. For example, the lectern mic might have the highest priority in the room, so you want to make sure it is not overriden by any of the other microphones in the room. "When we install an automixer, we typically set it up in blocks, creating separate mixers within the main mixer," says Zagryn. "Each type of microphone - ceiling, table, lectern, wireless - would be grouped in their own blocks and set up in a priority structure. In a really large installation where you're linking multiple mixers, you want to make sure you can establish priority blocks across all of the mixers so you don't have incidental audio overriding the important content." Dugan takes an opposite view, believing that priority systems are unnecessary. "An automatic mixing system should simply be transparent," he says. "People should determine who can talk when, not a program in a box." Once a system has been set up and configured, it should run in the background with no problems. But even with the best advance planning, sometimes changes to existing systems are unavoidable. You might need to add more microphones to accommodate additional users, or find that lecturers don't want to be stuck at a lectern - they want wireless microphones instead so they can move around the room. No matter what you are altering in the room, it wouldn't hurt to bring your system integrator (or a technical expert from the automixer's manufacturer) to the facility to help with your new mixer configuration (see sidebar). "Simply swapping things out can have effects you wouldn't anticipate," says Polycom's Smith. "No two vendors' microphones have the same sensitivity (voltage out vs. sound level in), so even changing the brand of microphones you are using could require some in-depth design capability in re-configuring your automixing system. Room layout changes may only require subtle alterations in the mixer, but could still affect overall performance. Your system integrator can usually make these changes quickly, give you new button presets, and have you up and running again in no time." Elaine Jones operates a PR agency specializing in the AV industry and is based in Salt Lake City, UT. She can be reached atelaine@ejonespr.com.